The Sun and Proxima Centauri and most of the stars you’ve heard of orbit the center of the Milky Way galaxy like children peacefully riding a carousel (with some weirdness caused by dark matter that we don’t need to get into). Now, imagine if a few toddlers were sprinting and shrieking across the peaceful scene. Who sent these nightmares? In the case of stars, scientists think they could have come from another galaxy. There aren’t many of these hypervelocity stars—somewhere around 20 have been observed, and there might be around 10,000 in the Milky Way total. There are a lot of reasons stars could be traveling at hypervelocities, speeds so fast that they move separately from the usual orbit of the Milky Way. Perhaps these stars could have gotten a kick from strange gravitational anomalies caused by supernovae, or debris, or a supermassive black hole. 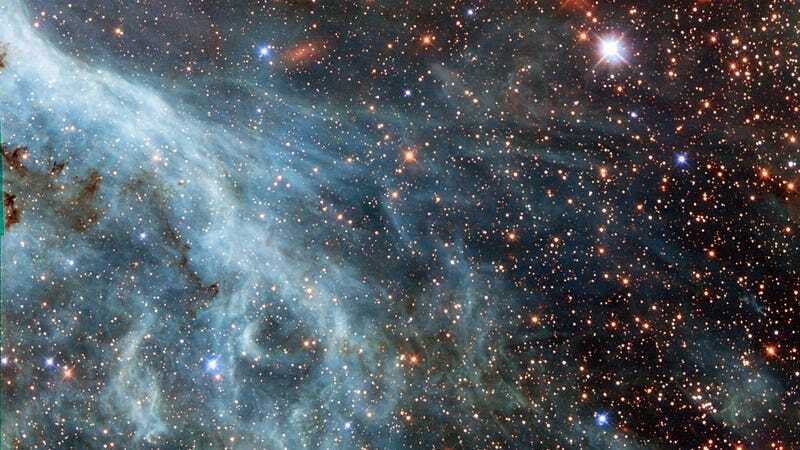 But a team of researchers from the University of Oxford think they might originate from a less obvious source: our galactic neighbor, the Large Magellanic Cloud. “We conclude that hypervelocity runaway stars from the Large Magellanic Cloud, as a consequence of star-formation, are unavoidable,” the authors write in a paper published a few months ago in the Monthly Notices of the Royal Astronomical Society and presented today at the National Astronomy Meeting in Hull, England. The Large Magellanic Cloud isn’t really a cloud. Instead, it’s a satellite galaxy of ours about a hundred times lighter and over a hundred fifty thousand light years away—a neighbor by galactic standards. It too rotates, at around 376 kilometers per second, and produces stars. That makes it a possible source of the speed demons we observe in our own Milky Way. For the new study, researchers built a model of the LMC’s behavior and found it could send one hyper-fast star to our galaxy every 300 thousand years or so. The model has several indirect observations to bolster it, mainly the behavior of certain LMC stars, including some of its brightest stars and some at the galaxy’s edges. It isn’t our first hint that these racing monsters are extra-galactic—observations of a star back in 2005 suggested the very same possibility. That star, HE 0437-5439, races along at 720 kilometers per second relative to the Sun. It would have needed to travel for around 100 million years to get from the galactic center to where it is now, but it’s a star that should only exist for around 25 million years. Since it’s much closer to the Large Magellanic Cloud than the Milky Way’s galactic center, that team thought the LMC have been its point of origin. Obviously, this new research is based on a model, so we can’t take it as absolute truth. But the authors are confident about their predictions, and think it’s now a question of whether or not the process is the main source of hypervelocity stars in our own galaxy.